Just like our home planet, Mars hosts many volcanoes, and in fact is home to the largest volcano in the solar system, Olympus Mons . Researchers have just found evidence that as well as being giant, Martian volcanoes differ from ones on Earth in the sheer length of time they erupt for. An unusual meteorite was found in Algeria in 2012 which was small enough to fit in the palm of your hand and weighed just 0.2 kilograms. The scientists named it Northwest Africa (NWA) 7635, and although small, it revealed to them some intriguing mysteries about Martian volcanoes. The findings were published in the journal Science Advances . Analysis of the rock led scientists to date it at about 2.4 billion years old. This was surprising because out of the 100 meteorites identified as originating from Mars, about 10 others are in the same group as NWA 7635, and scientists have dated all of them at about 500 million years old. "We've never seen anything like that on Earth," said Dr Marc Caffee, professor of physics and astronomy at Purdue University and a member of the research team, in a statement . The group of 11 meteorites, including NWA 7635, were all exposed to cosmic rays for about 1.1 million years. But the age gap between the other 10 and NWA 7635 means that there was a period of at least 2 billion years where one particular volcano was erupting. "What this means is that for 2 billion years there's been sort of a steady plume of magma in one location on the surface of Mars," Caffee said. "We don't have anything like that on Earth, where something is that stable for 2 billion years at a specific location." 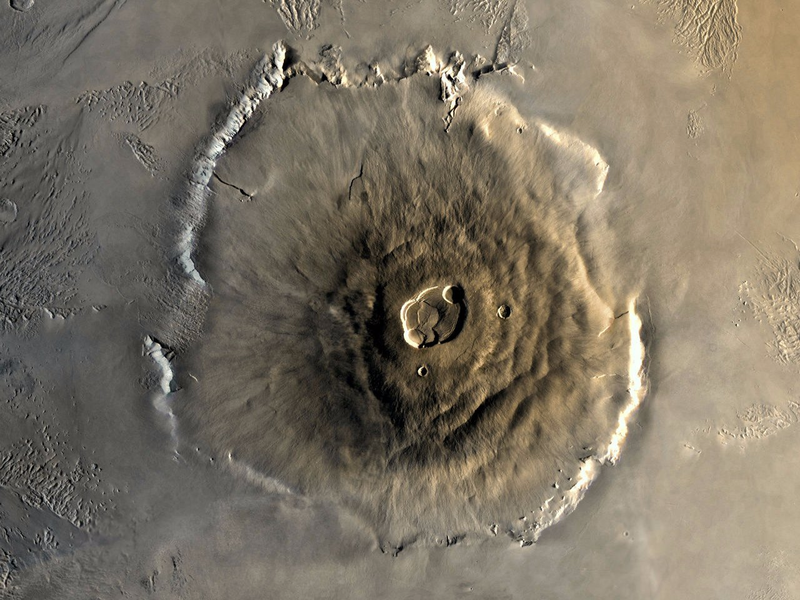 The researchers aren't certain whether the meteorites came from Olympus Mons or another volcano, but it's a good candidate. It is 17 miles tall with a footprint nearly the size of Germany. Volcanoes can grow so enormous on Mars because there are no plate tectonics like there are on Earth. According to NASA, Mars used to be a lot more similar to Earth than it is today, and it used to have early tectonic plates that ground past each other and formed craters and volcanoes. However, at some point in its history, Mars cooled down. Thus the molten rock beneath the plates solidified and the tectonic plate formation ground to a halt. Now that there appears to be no geological movement, there's less chance of eruptions being interrupted by the crust shuffling around. Astronauts have never walked on Mars, but thanks to these meteorites, they can still study the surface of the red planet. Plus, Mars has a low gravitational force and a thin atmosphere, which makes it easier for rock fragments released during impacts to fly off the planet's surface. However, these fragments don't head straight for Earth. Instead, they can orbit in space for hundreds of thousands, sometimes millions, of years, until something else in space interrupts their journey. Then it can still take another thousand years or so for the fragments to collide with our planet. In other words, these little meteorites have been travelling a long time to get here — and they contain some fascinating insight.